The first night in an albergue is always interesting. One identifies the snorers (and vows to avoid them for the rest of the trip), figures out group dynamics insofar as leaders/followers go, and (through trial and much error) decides with whom one should converse and whom to avoid. Personally, we met a Dutch father and son team who like to listen along with an American duo who like to talk. Mikey’s guessing that the Americans are from the Southwest – probably Arizona. Nice people, but they did make that passé remark about California falling off into the ocean. (We’ll have to keep an eye on them.) Oh, and the snorer in our room is a guy from Japan who speaks surprisingly passable Spanish and a good bit of broken English. He’s a very nice guy, but maybe one to avoid sleeping next to. As we’ve mentioned before, the Camino is not always pretty. Yes, this bridge was pretty in the morning light, but we had to go through some rather dull streets to get here. 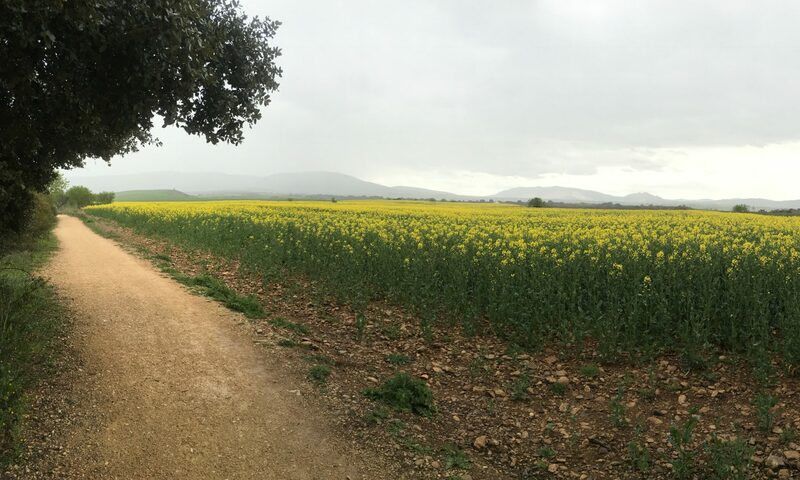 Yes, the Camino often leads us through undesirable places, but it makes up with beautiful open country like this. And there’s always those random defense towers just out in a field. Thankfully, a good bit of the morning’s walk was along semi-shaded paths near orchard-like areas. There were so many wildflowers covering the area. We came upon this sign, but are still unsure how to feel. Yes, mileage reminders are encouraging – when you’re almost there! But, 927km to go? No bueno. Upon nearing the city, we met this guy just getting his grub on in an open area. Speaking of asking, after arriving in the town and settling into the donativo albergue (donativo means that the stay is technically free, but one can make a donation. Oh, and if you try to cheat these places by not donating, you’re probably going to hell or something), Mikey asked the volunteer host if the church would be open today. He was unsure, but said he would check on it for us. About an hour later, he found Mikey and gave him the mass schedule so that he could see the inside. What a nice Frenchman. Common in lots of country villages are the stork nests high up in the church steeples. Talk about a wakeup call at morning mass! The interior was very simple and constructed in a very Andalusian style: white, gold, and brown wood. The main altar was highly functional, but lacking the eccentricities found in more wealthy churches. We did see another St Christopher painting that liked rather old. And there was our good friend St James (Santiago) hanging with Jesus. Speaking of hangouts, if not going to church, it looks like Bar Chicago is the place to be! Mikey’s rationale for dining here was the venison stew! While not as good as his father Frank’s, it definitely got the job done. Well, as nice as the French hospitalero seemed, they’re always strict about curfew, so we’d better head back. Goodnight from Andalusia.